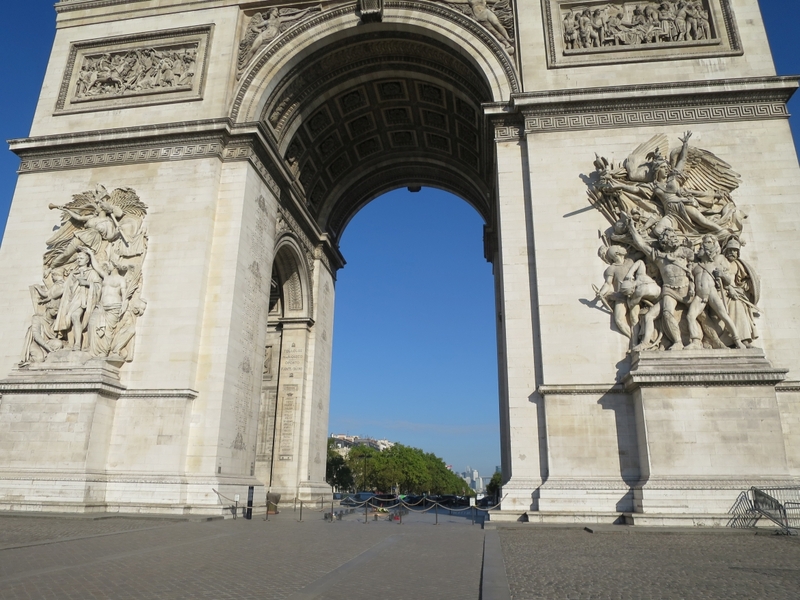 In Part 1 of Mr. Housch’s visit to Paris’ Arc de Triomphe, he walked around the Place Charles de Gaulle to show the monument from many angles. 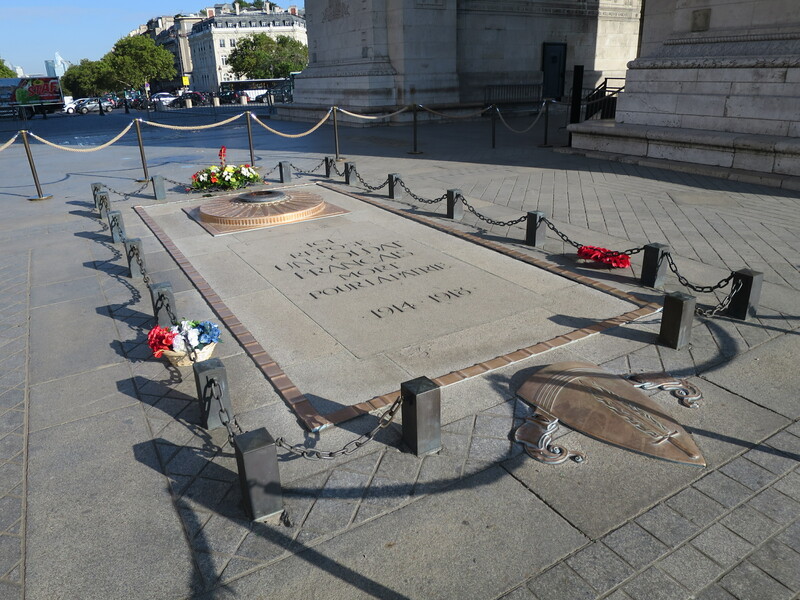 In today’s Part 2 post Mr. Housch has crossed under the street to walk around the monument.This image was taken facing southeast at approximately 9:00 AM on Thursday, August 2, 2018. 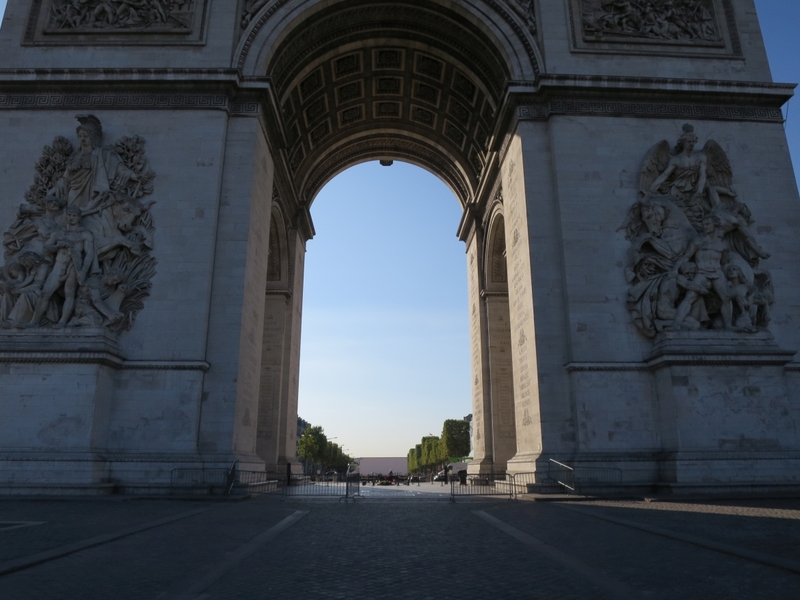 After exiting the underground tunnel and arriving at the Arc, one’s first impulse might be to…This image was taken facing west at approximately 9:00 AM on Thursday, August 2, 2018. 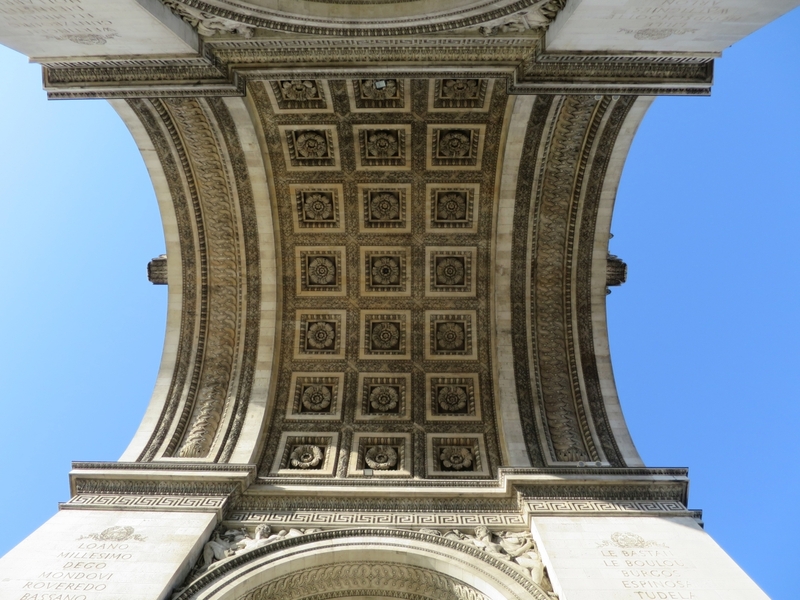 …walk over and stand beneath the arch.This image was taken facing southwest at approximately 9:00 AM on Thursday, August 2, 2018. 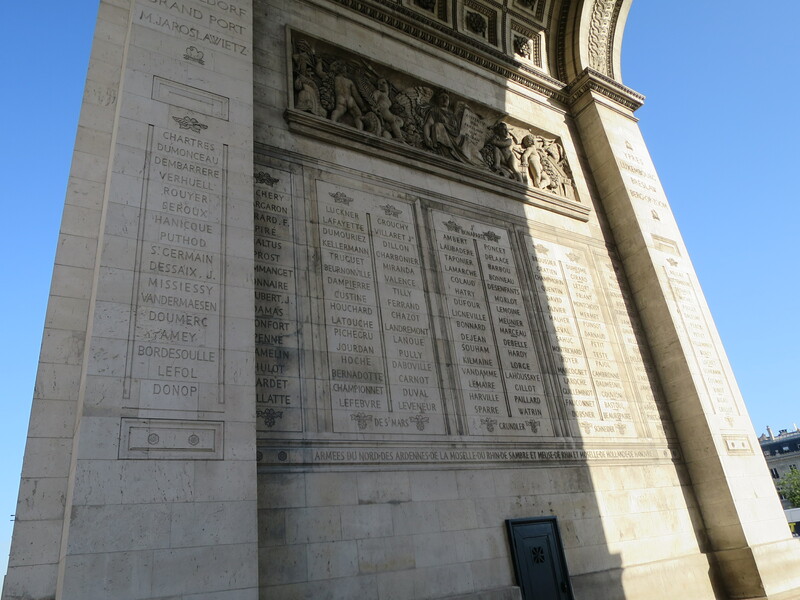 On the inside of the walls are names of military leaders of the French Revolution and the First Empire when Napoleon Bonaparte made himself Emperor. 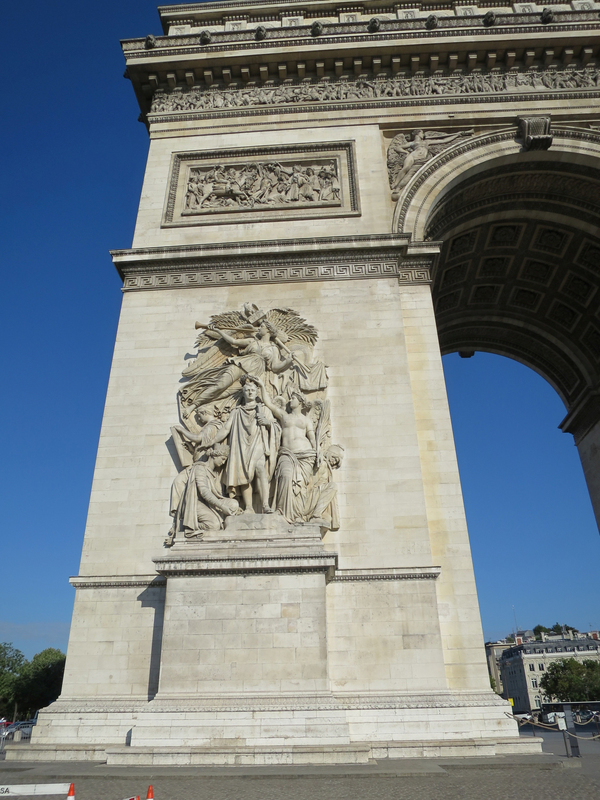 This pillar contains the name of Lafayette who was a great help to us during the American Revolution.This image created facing north at approximately 9:00 AM on Thursday, August 2, 2018. 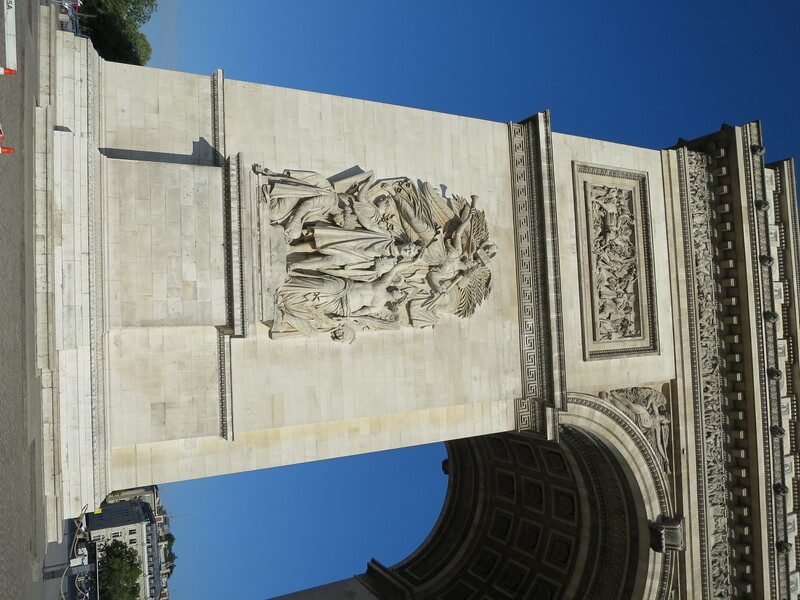 This pillar contains the name of Rochambeau who also helped us during the American Revolution, especially during the Siege of Yorktown, Virginia.This image was taken facing east at approximately 9:00 AM on Thursday, August 2, 2018. 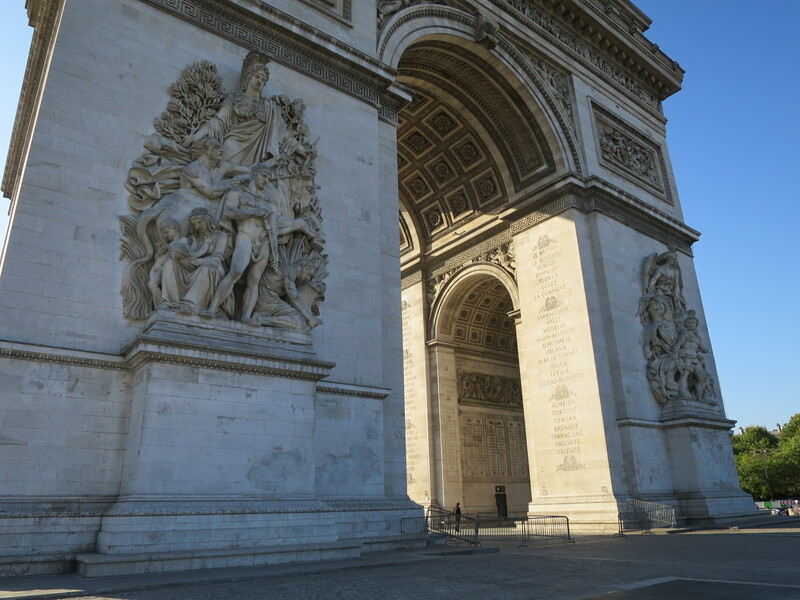 The design of the bottom of the Arch contains 21 sculpted roses.This image was taken facing up at approximately 9:00 AM on Thursday, August 2, 2018. 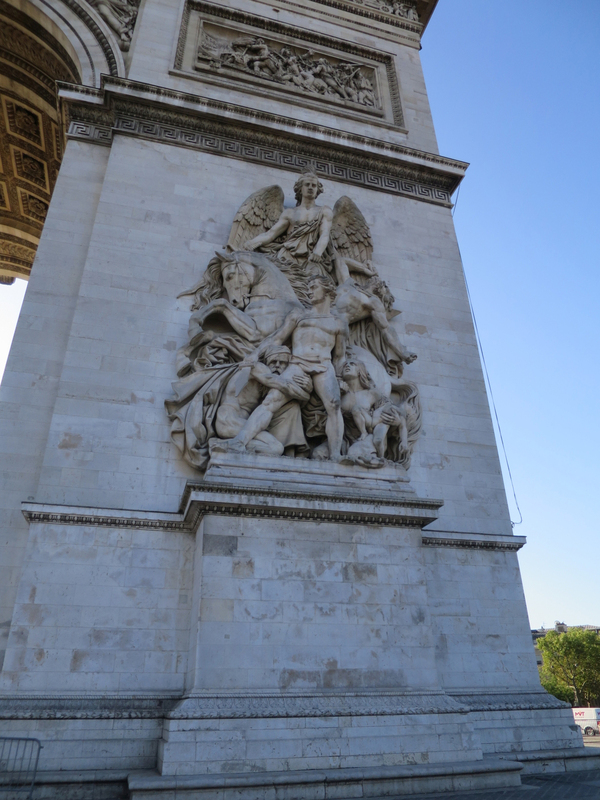 The outside of the pillars contain four large sculptures.This image was taken facing northwest at approximately 9:00 AM on Thursday, August 2, 2018. 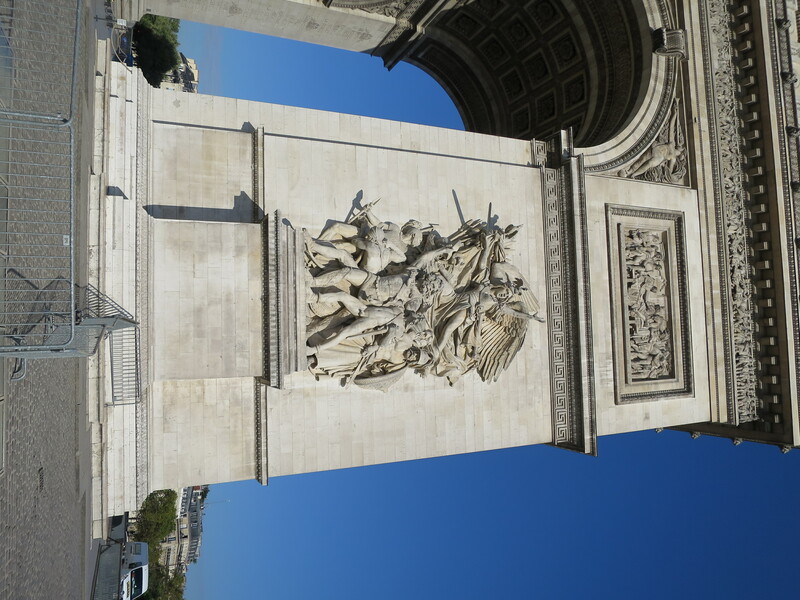 This is “The Departure of the Volunteers of 1792” which occurred during the French Revolution and is the year the French national anthem, “The Marseillaise” was written.This image was taken facing northwest at approximately 9:00 AM on Thursday, August 2, 2018. 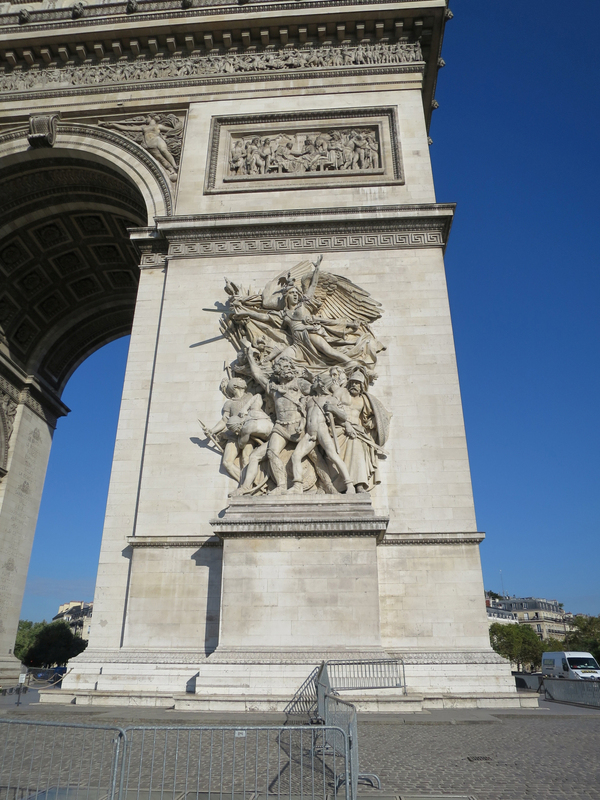 “The Triumph of 1810” depicts the French under Napoleon after they defeated the Austrians. 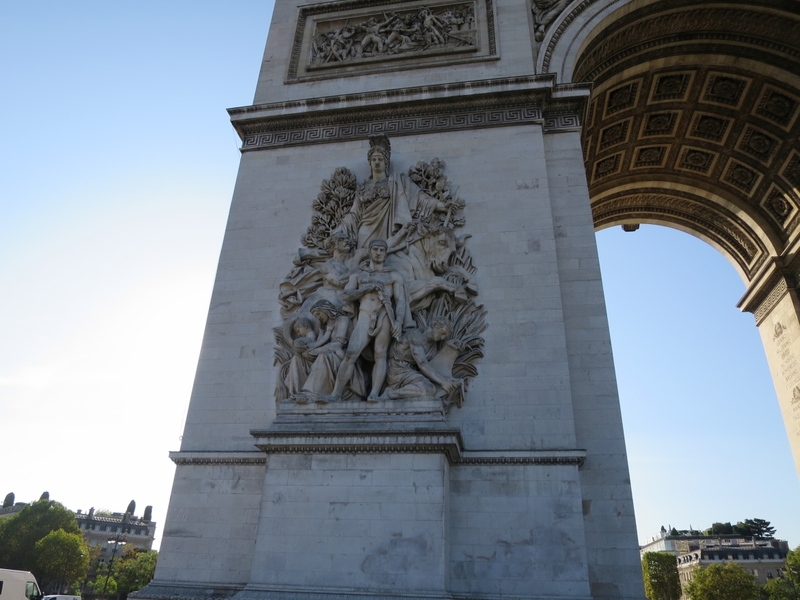 Napoleon is having the wreath of victory placed on his head.This image was taken facing northwest at approximately 9:00 AM on Thursday, August 2, 2018. 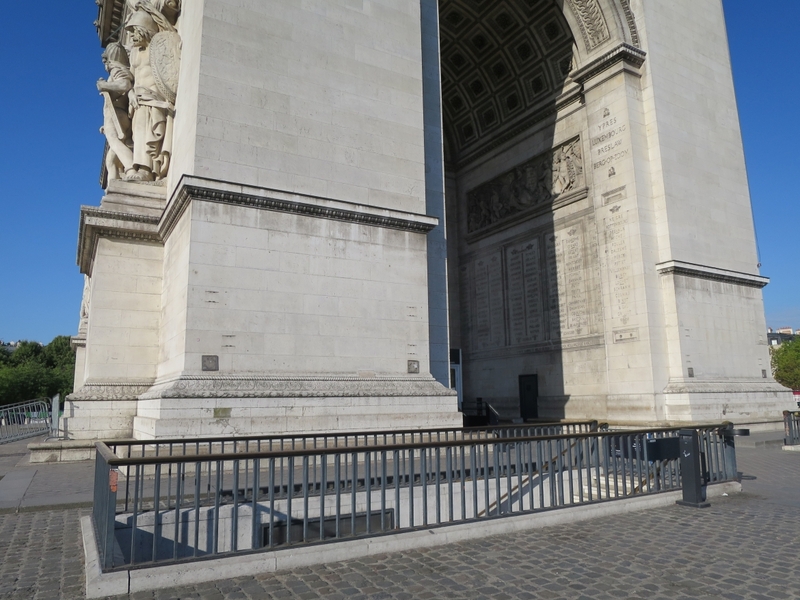 On the west side of the monument are two more large sculptures.This image was taken facing southeast at approximately 9:00 AM on Thursday, August 2, 2018. “The Resistance of 1814” shows France’s struggles against Austria, Russia, Prussia (part of Germany) other German states, Portugal, the United Kingdom, Sweden and Spain. Those countries defeated Napoleon and placed him in exile on the island of Elba located near Italy.This image was taken facing southeast at approximately 9:00 AM on Thursday, August 2, 2018. The sculpture closest to the camera is titled “The Peace of 1815.”This image was taken facing south at approximately 9:00 AM on Thursday, August 2, 2018. 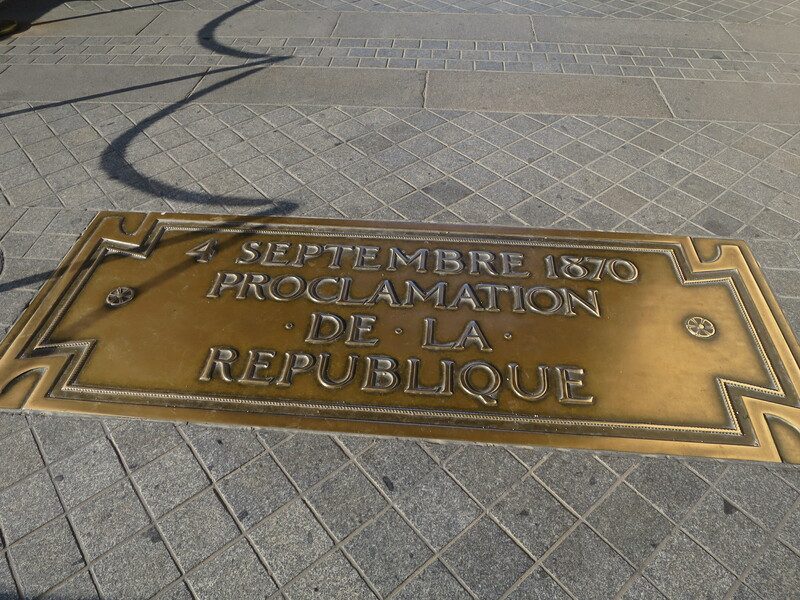 “The Peace of 1815” commemorates the end of the Napoleonic Wars following the Treaty of Paris of 1815. 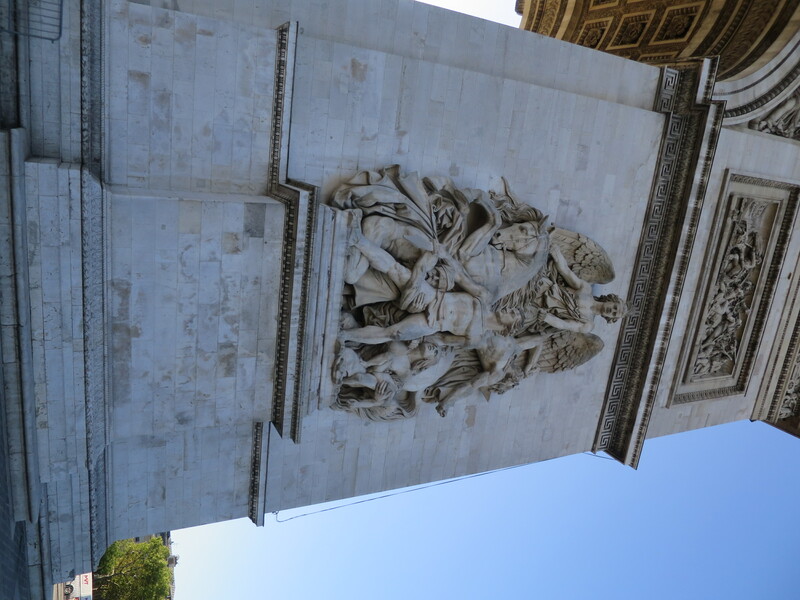 In this sculpture, the soldier is putting his sword back into his scabbard, and his countrymen are pursuing peaceful activities.This image was taken facing southeast at approximately 9:00 AM on Thursday, August 2, 2018. 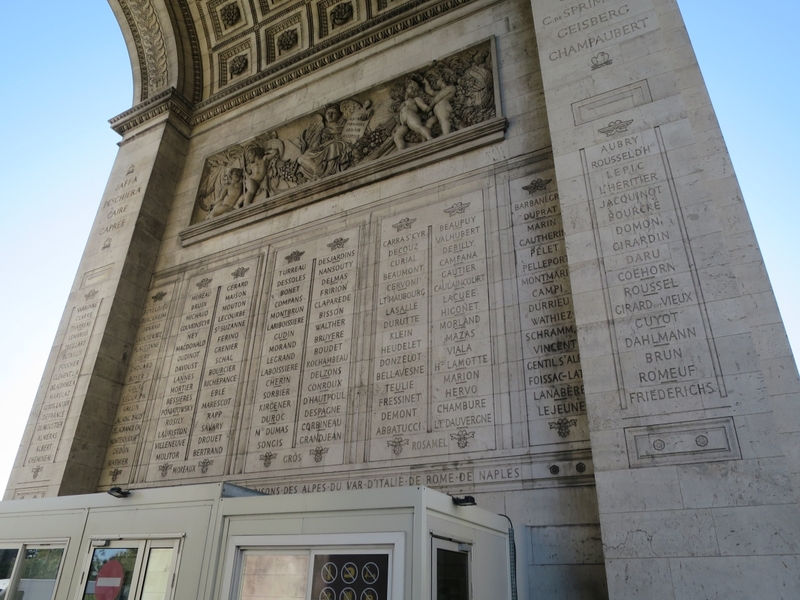 Underneath the western side of the Arc de Triomphe are some plaques remembering military conflicts that took place after the Napoleonic Wars. The Place de Grand Armee is the road in the distrance straight ahead. A bus is driving towards the camera. In the distance looking towards “modern Paris” can be seen a large arch, known as the “Grande Arche de la Defense.” Pay no attention to the shadow of the man standing on the left and taking this photograph. He is obviously an amateur who doesn’t know what he is doing.This image was taken facing northwest at approximately 9:00 AM on Thursday, August 2, 2018. One of the plaques commemorates the beginning of the Third French Republic which lasted from 1870 until the Germans took over France in 1940 and formed the Vichy government.This image was taken facing northwest at approximately 9:00 AM on Thursday, August 2, 2018. 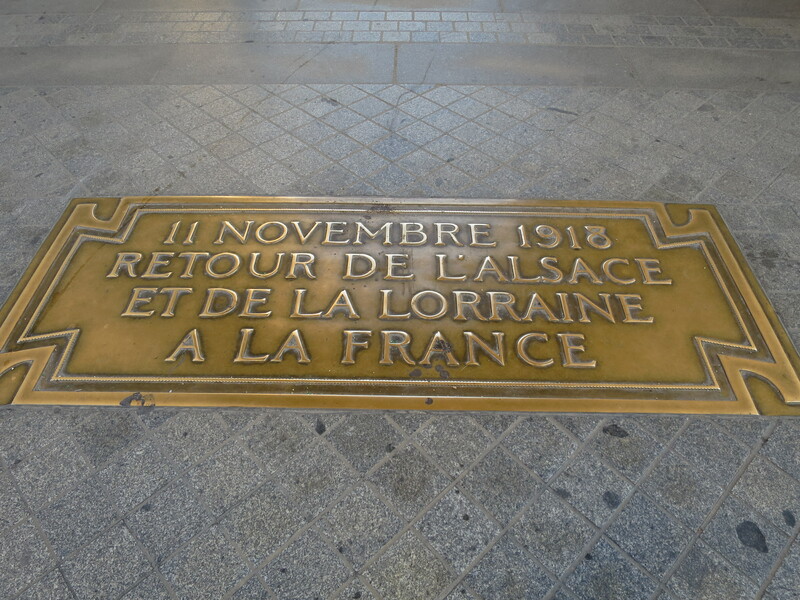 Another plaque marks the end of World War I and the return of the Alsace-Loraine territory from Germany to France.This image was taken facing northwest at approximately 9:00 AM on Thursday, August 2, 2018. 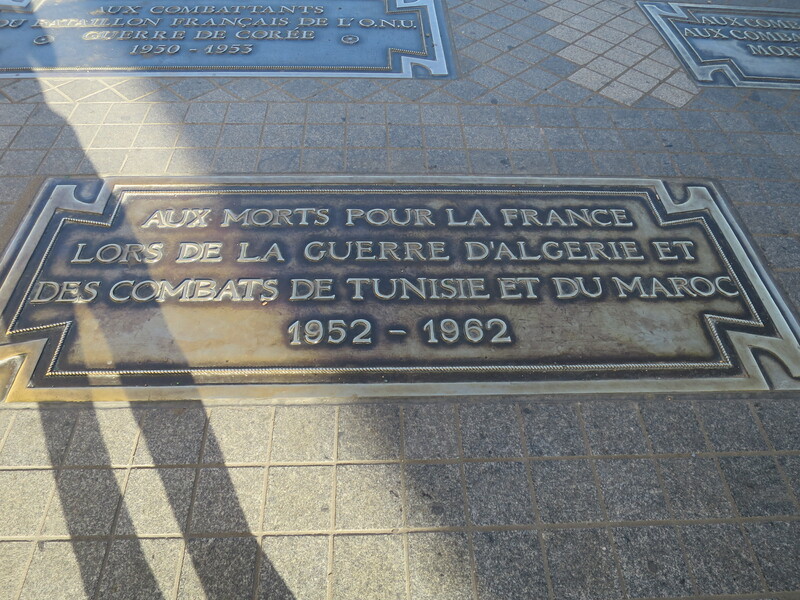 This plaque commemorates France’s involvement in World War II. It honors not only its military personnel in the field. 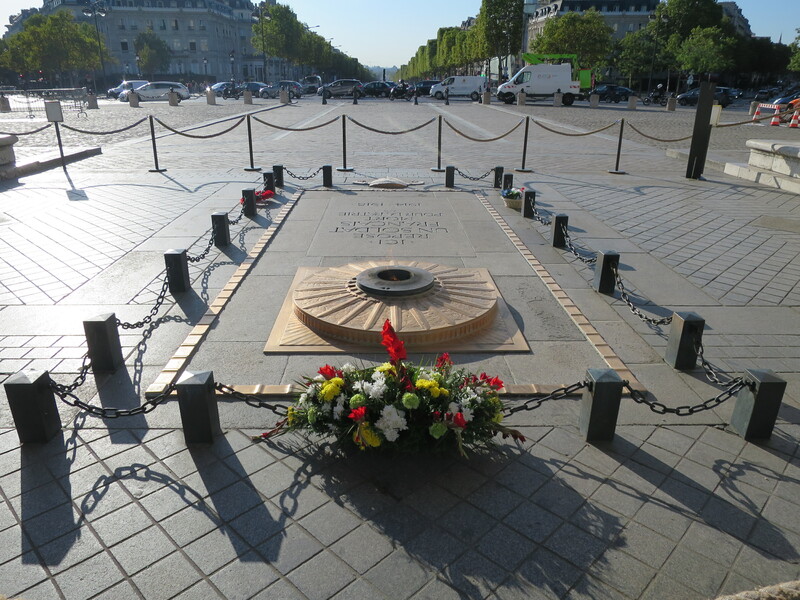 It honors those in France who resisted the German occupation of their country.This image was taken facing northwest at approximately 9:00 AM on Thursday, August 2, 2018. 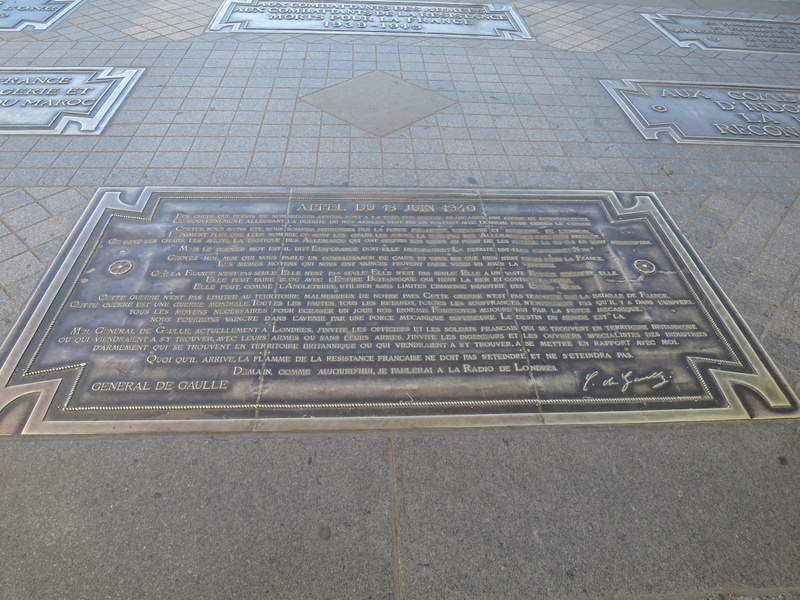 This plaque honors the Appeal by French General Charles de Gaulle to resist the German occupation of their country during World War II. 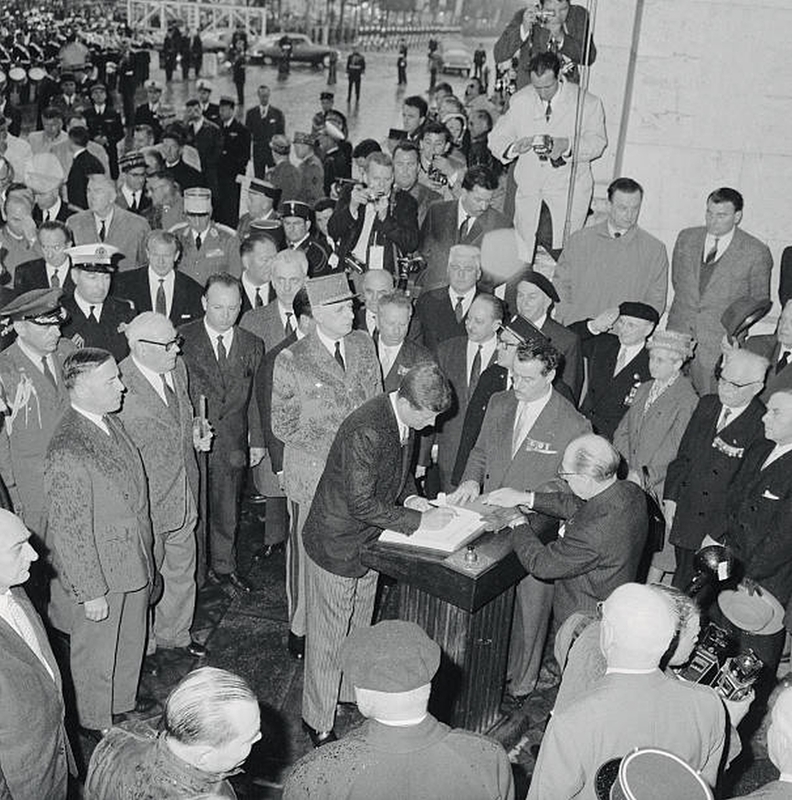 The speech was made from London on June 18, 1940.This image was taken facing northwest at approximately 9:00 AM on Thursday, August 2, 2018. 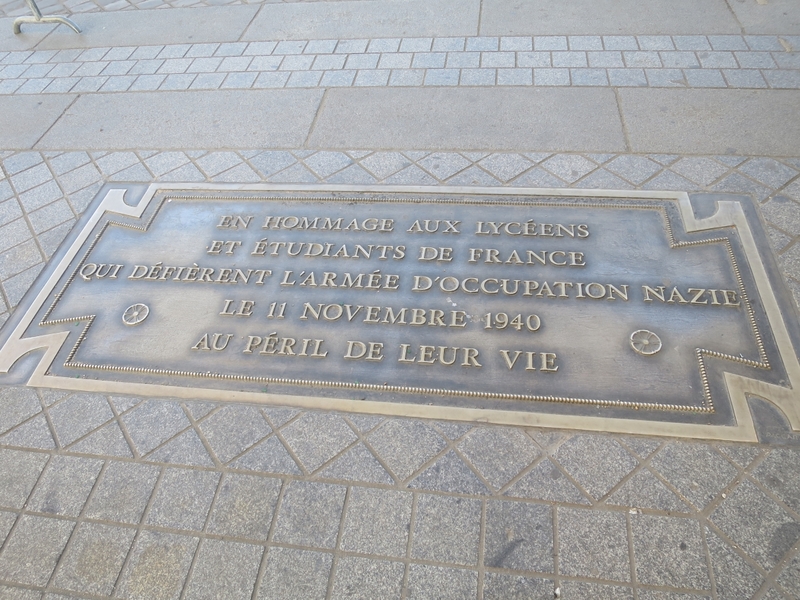 Speaking of the Resistance, this plaque marks the first large public demonstration against Nazi occupation. 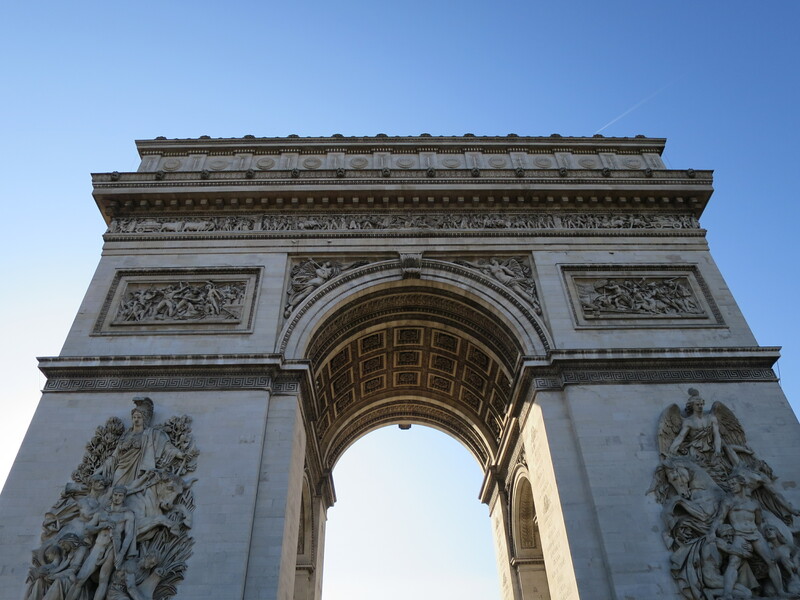 High School students and college students gathered at the Arc de Triomphe to remember the French victory over Germany in World War I. 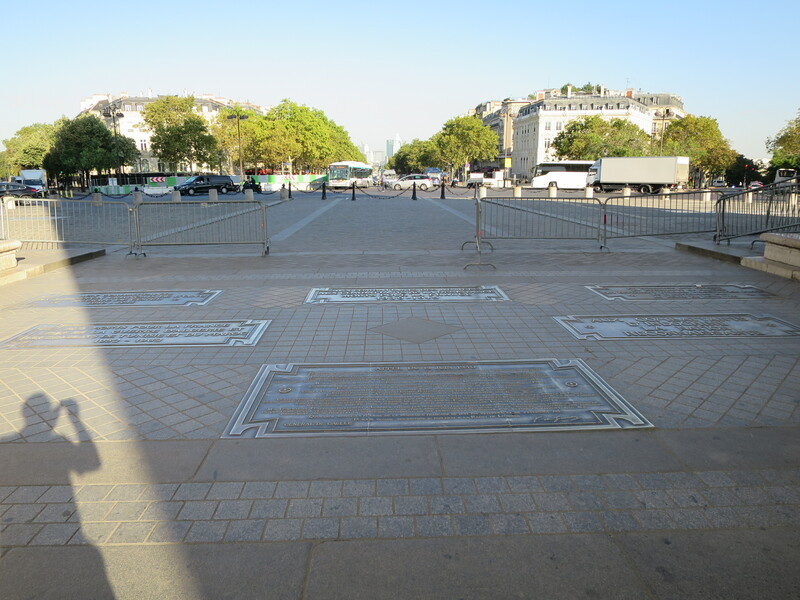 On November 11, 1940, approximately 3000 young people sang the French patriotic song, “The Marseillaise,” and shouted “Long Live France!” and “Long Live De Gaulle.” When the German army attempted to break up the event, 15 people were wounded.This image was taken facing northwest at approximately 9:00 AM on Thursday, August 2, 2018. 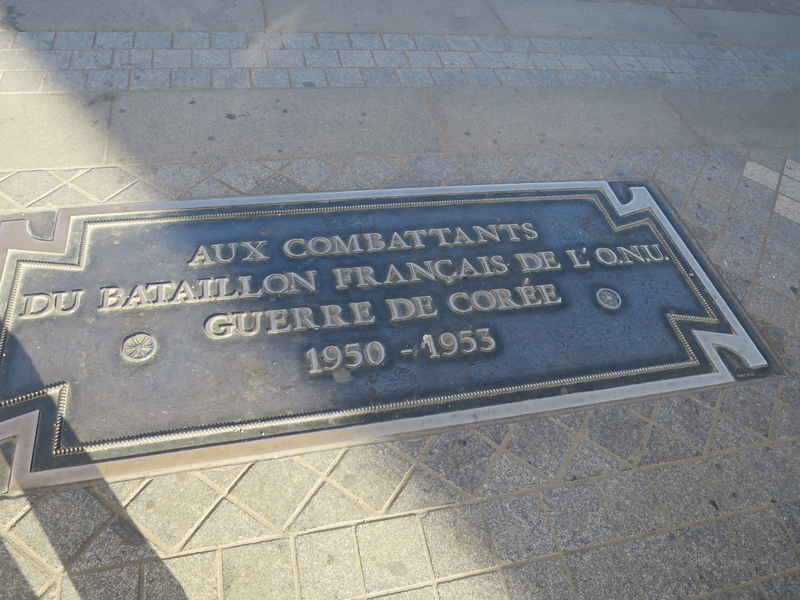 This plaque remembers the participation of France in the Korean conflict.This image was taken facing northwest at approximately 9:00 AM on Thursday, August 2, 2018. This plaque honors the French dead in wars and battles in Algeria, Tunisia, and Morocco.This image was taken facing northwest at approximately 9:00 AM on Thursday, August 2, 2018. 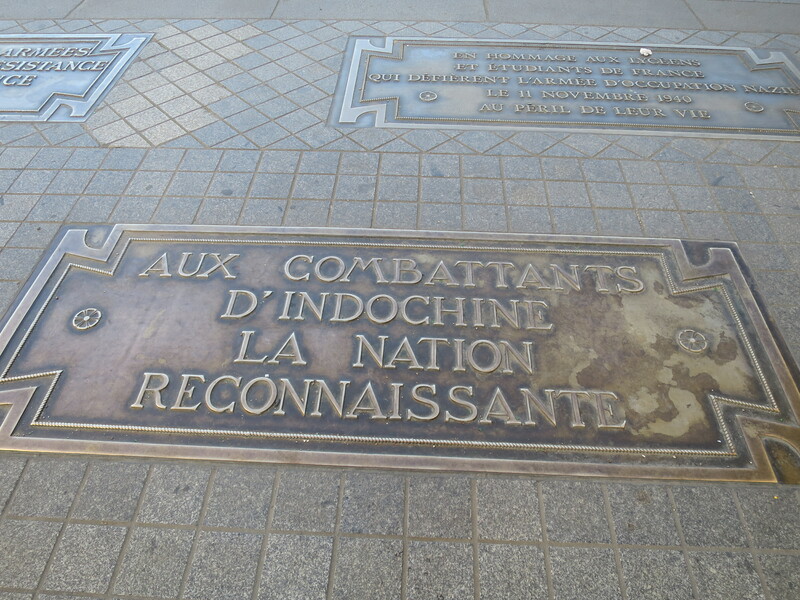 This plaque honors the French involvement in Vietnam. The United States would become heavily involved in Vietnam after the French left that country.This image was taken facing northwest at approximately 9:00 AM on Thursday, August 2, 2018. 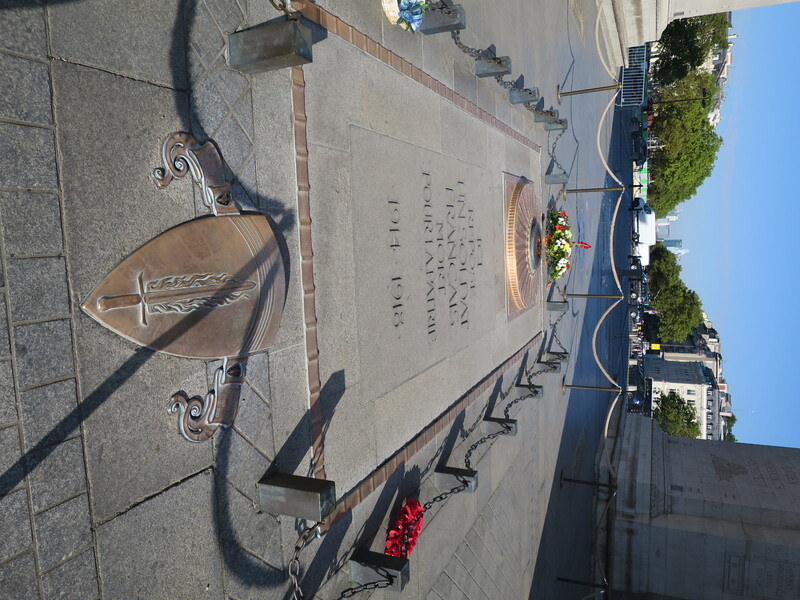 Beneath the Arc de Triomphe is the Tomb of France’s Unknown Soldier. 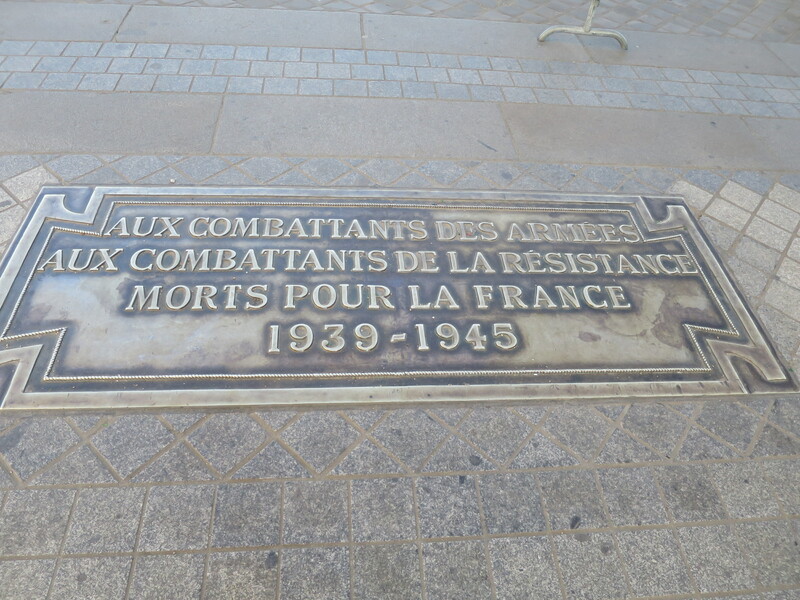 The inscription reads, “Here lies a French soldier who died for his country.”This image was taken facing north at approximately 9:00 AM on Thursday, August 2, 2018. 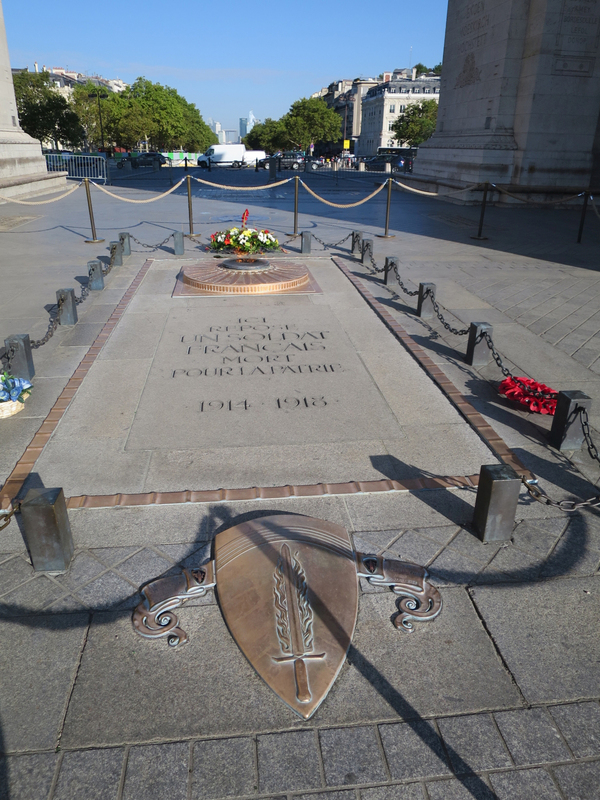 The Unknown French soldier from World War I was placed here on January 28, 1921.This image was taken facing northwest at approximately 9:00 AM on Thursday, August 2, 2018. On October 22, 1922 the French Parliament declared November 11th of each year (November 11, 1918 marked the last day of World War I) to be a national holiday.This image was taken facing south at approximately 9:00 AM on Thursday, August 2, 2018. 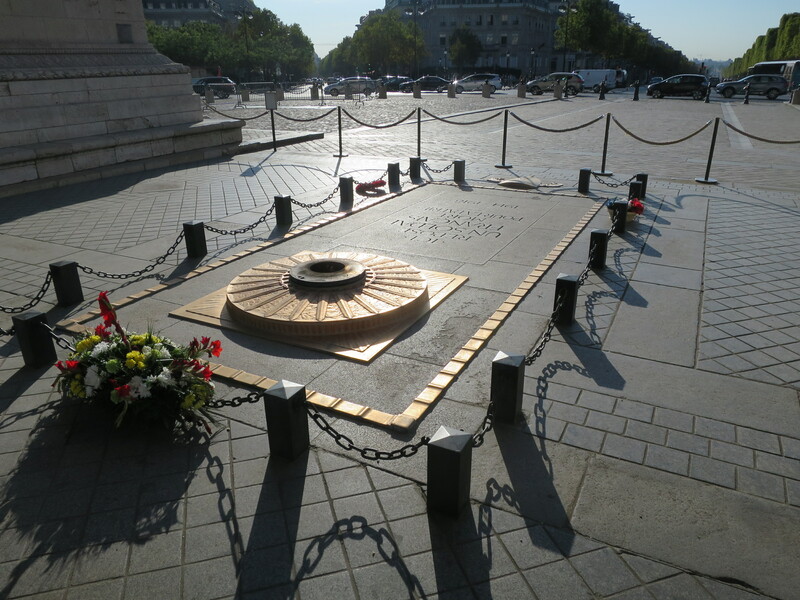 On top of the grave burns the eternal flame which burns in the darkness to recall the sacrifice of this and many other French military personnel. 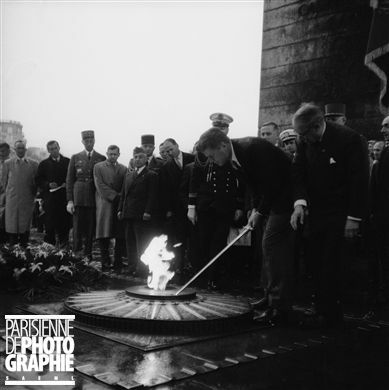 On November 11, 1923 the French Minister for War lit the eternal flame for the first time.This image was taken facing southeast at approximately 9:00 AM on Thursday, August 2, 2018. 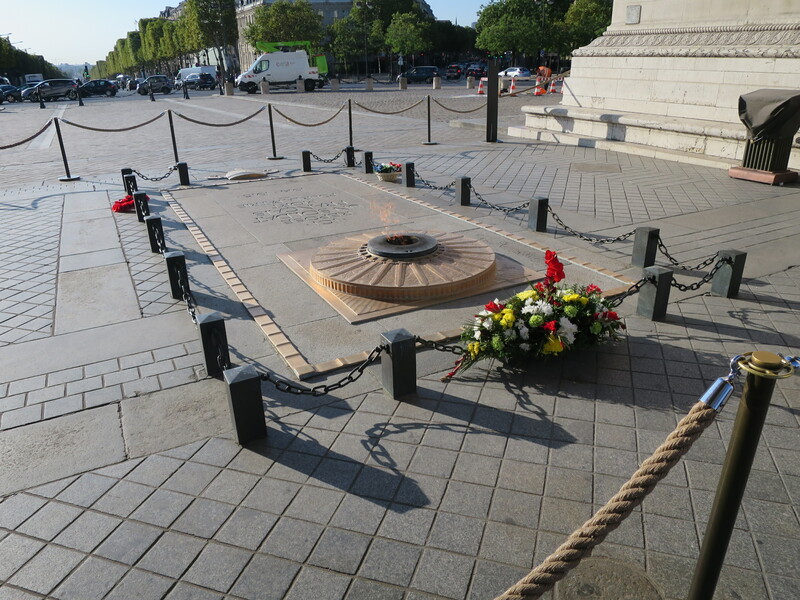 The flame is relit/rekindled each evening at 6:30.This image was taken facing east at approximately 9:00 AM on Thursday, August 2, 2018. 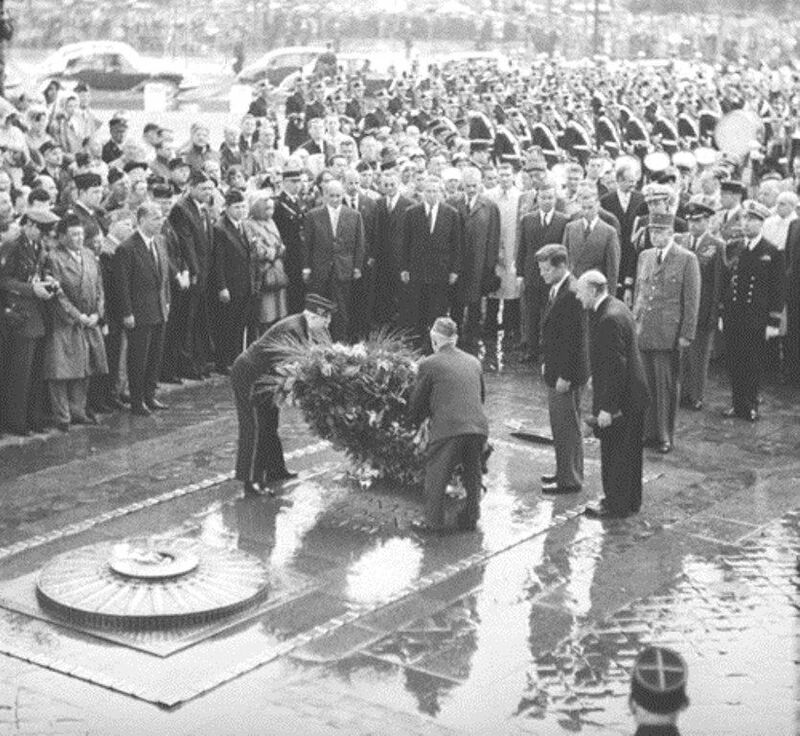 On a rainy day in 1961, United States President John F. Kennedy and French President Charles de Gaulle paid their respects at the Tomb of the Unknown Soldier.This image was taken facing east on Wednesday, May 31, 1961. 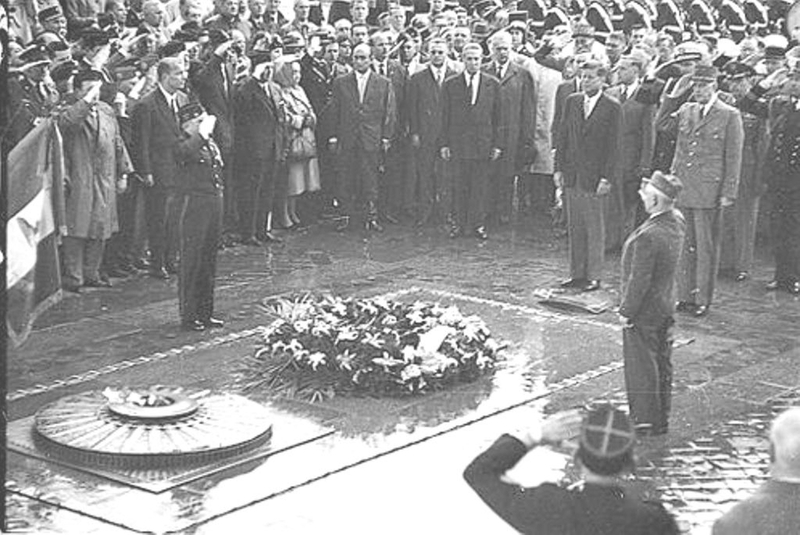 President Kennedy laid a wreath at the grave…This image was taken facing east on Wednesday, May 31, 1961. …rekindled the eternal flame…This image was taken facing southwest on Wednesday, May 31, 1961. …and signed a book of remembrance.This image was taken facing north on Wednesday, May 31, 1961. 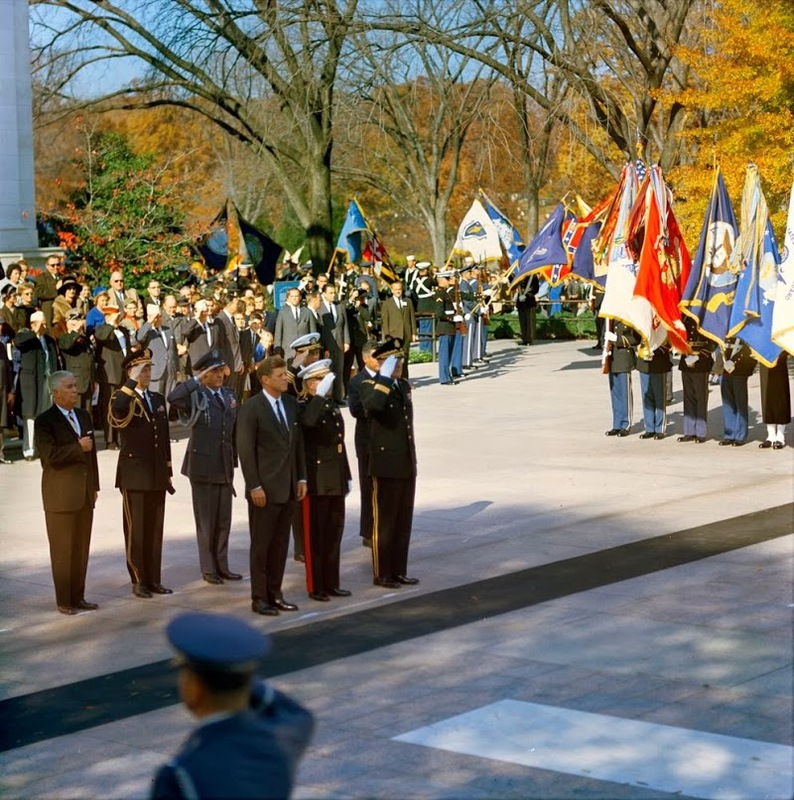 Eleven days before he was assassinated, President Kennedy attended Veterans Day ceremonies at Arlington National Cemetery’s Tomb of the Unknown Soldier.This image was taken facing northwest on Monday, November 11, 1963. 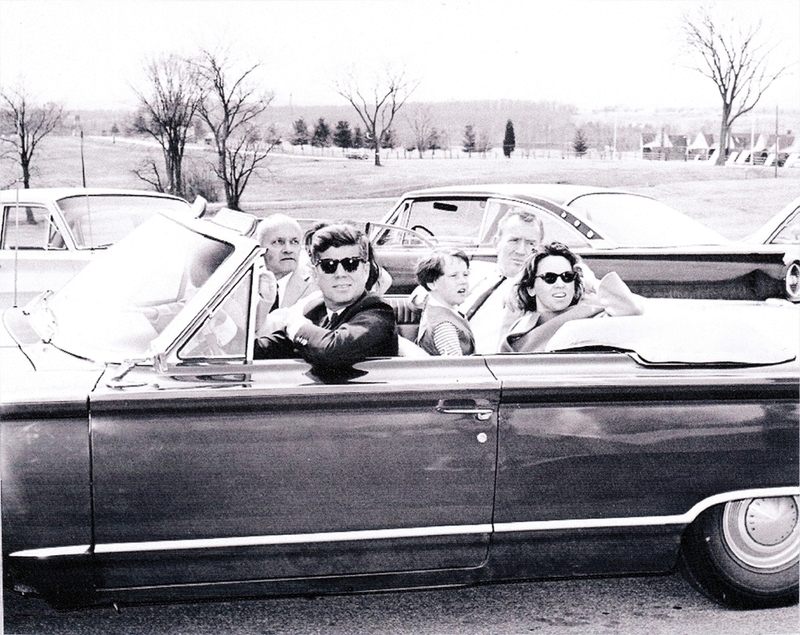 In March, 1963, President Kennedy saw another eternal flame when he toured Gettysburg National Military Park.This image was taken at approximately 1:20 PM facing southwest on Sunday, March 31, 1963. 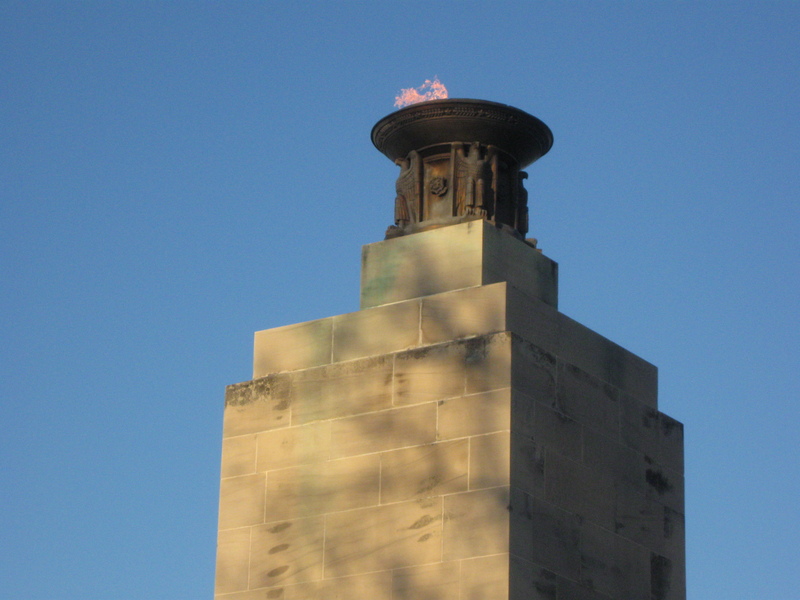 That eternal flame is located on top of the Eternal Light Peace Memorial on Gettysburg’s July 1, 1863 battlefield.This image was taken facing northwest at approximately 8:00 AM on Thursday, December 25, 2008. 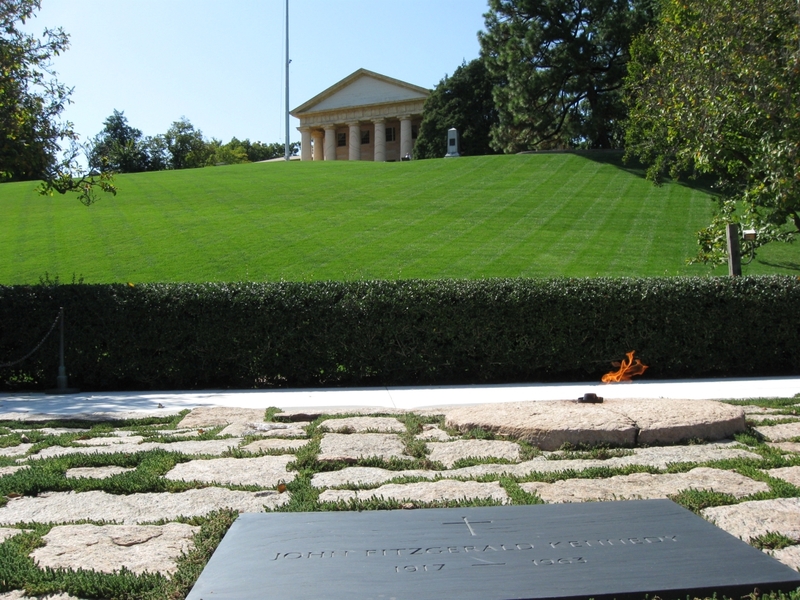 Mrs. Kennedy was probably inspired by the eternal flame over the grave of the Unknown Soldier at the Arc de Triomphe for President Kennedy’s grave at Arlington National Cemetery. The logistics of actually placing the flame at Arlington were worked out with the National Park Service staff at Gettysburg. According to Presidential Aide Jack Valenti “a few telephone calls were made to the National Military Park at Gettysburg for construction details of the Eternal Peace Light Monument.”This image was taken facing southwest at approximately 2:30 AM on Sunday, September 27, 2009. 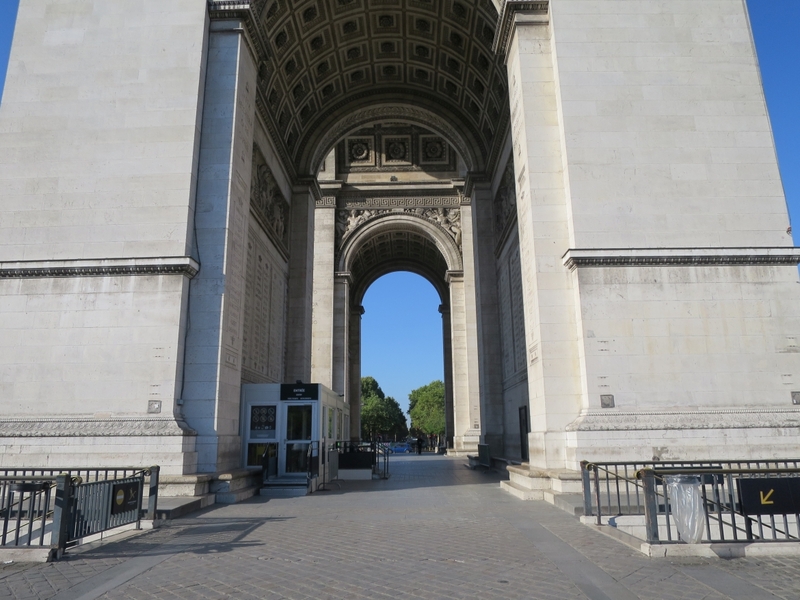 In Part 3 of our visit to the Arc de Triomphe we will go through the glass and metal security area on the left and climb up inside a column to the middle section and top of the arch.This image was taken facing southwest at approximately 9:00 AM on Thursday, August 2, 2018.